I have never cooked an omelette in my entire life until that Tuesday. I have no penchant for cooking unlike my friends. I'm the one doing more of the eating/tasting and I'm not even good at that. One example: I can't tell which is the best tapa.. I just know which ones I like and which ones I don't. They're all good for me. 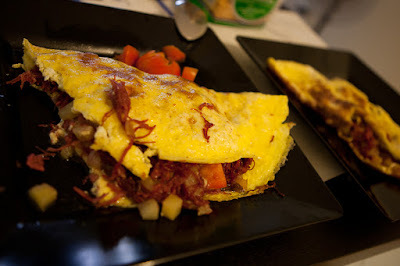 In an attempt to outdo myself that Tuesday, I decided to cook an omelette. I figured the easiest thing that I could probably cook with eggs on it without being too simple as a fried/boiled egg was an omelette. Thanks to Google I found what looked like an easy recipe. Cook the cubed potatoes in oil until tender. Add the corned-beef. Stir, and let it cook for about 3 minutes. Whisk your eggs and milk. Season with salt. In a skillet, I used my iron skillet by the way, melt butter over low heat. Pour in egg mixture. As the omelet cooks, tilt the pan and draw the edges in toward the center with a fork. Shake pan gently to distribute the uncooked portion. Loosen the edges of the omelet with a spatula and tip the pan forward to fold the omelet in half, covering the filled half. Woke up early Tuesday morning and it took me 1.5hrs to finish 3 servings. I never tasted the stuff until the whole thing was done. I was crossing my fingers and toes, hoped not to burn the entire thing. I'm notorious for burning eggs and even hotdogs. That day must have been my lucky day as the omelette looked perfect to me. Until the next birthday dish!